When you delete an item from a SharePoint document library or list, it isn’t immediately removed from SharePoint. Deleted items go into the site recycle bin for a period of time. During that time, you can restore the items you deleted to their original location. If you're using SharePoint Online, you can even view and restore items that were deleted by someone else, as long as you have edit permissions on the item. 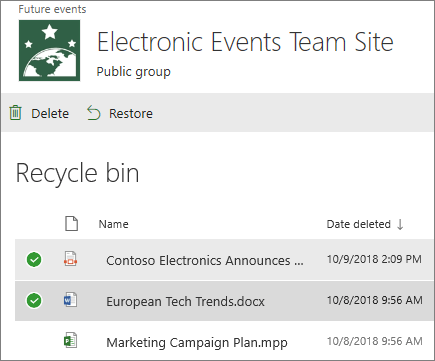 For info about emptying items from the site recycle bin, see Delete items or empty the Recycle Bin of a SharePoint site. If you delete files or folders that you're syncing, you can restore them from the Windows Recycle Bin on your PC. To put your Windows recycle bin on your desktop, see Show or hide the Recycle Bin. The information in this article also applies to OneDrive for Business files. To learn how to restore files in OneDrive, see Restore deleted files or folders in OneDrive. You can restore items you delete, and items other people delete (as long as you have permission to edit the items). Click Settings , and then click Site Contents. The Recycle bin is in the top right portion of the Site Contents page. Note: If you don’t see a Recycle Bin in SharePoint Servers 2016 or 2013 — the Recycle Bin might have been disabled. Talk with your farm or server administrator. If you're an administrator, see Configure SharePoint Recycle Bin Settings. On the Recycle Bin page, click the box to the left of the items or files you want to restore. Note: If you don’t see the item you’re looking for, and it was deleted recently, a site collection administrator might be able to restore it from the site collection recycle bin. If you're the site collection administrator, see Restore deleted items from the site collection recycle bin. When an item is restored, it is restored to the same location that it was deleted from. Deleted items are retained in recycle bins for a certain period of time. For SharePoint Online, the retention time is 93 days. It begins when you delete the item from its original location. When you delete the item from the site recycle bin, it goes into the site collection recycle bin. It stays there for the remainder of the 93 days, and then is permanently deleted. You can restore a list, list item, library, file, or a version of a file to its original location, as long as you have not already deleted its parent. For example, you can't restore a version of a file if the file itself has been deleted. That's because when you delete a file, you delete all versions of the file. Similarly, you cannot restore a file if the library to which it belonged has been deleted. You must first restore the library and then restore the file to the library. When you restore a library, all of the files that the library contains are also restored. Also when you restore an item that was originally located in a deleted folder, the folder is recreated in its origianl location and the item is restored in the folder. But the entire contens of the folder isn't restored. Was this article helpful? If so, please let us know at the bottom of this page. Let us know what was confusing or missing. Please include your version of SharePoint, OS, and browser. We'll use your feedback to double-check the facts, add info, and update this article.